r3v Ska & Rocksteady Night on the 21st of January! What a pleasure! 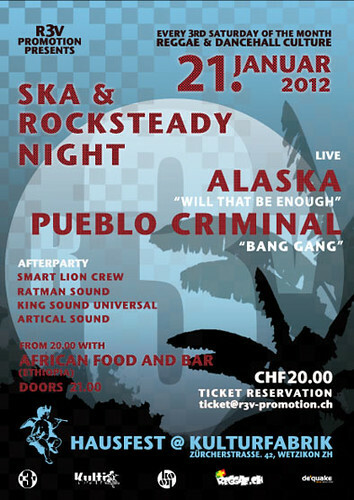 Pueblo Criminal and Alaska will rock the stage of Kulturfabrik Wetzikon at the r3v Ska & Rocksteady Night on the 21st of January! Besides delicious food from Ethiopia, we expect a relaxed but hot evening with a great after show party!